Home SharperIron Forums Principles & Consequences Front page article archive Book Review - Just How Married Do You Want to Be? 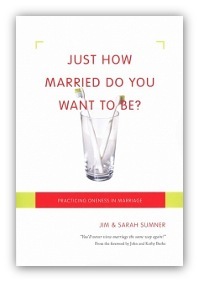 Book Review - Just How Married Do You Want to Be? Jim and Sarah Sumner knew from the start of their relationship that they were an unlikely match. A former male stripper and the first woman to earn a Ph.D. in systematic theology from Trinity Evangelical Divinity School were just not meant to be together—or so many people thought. But twelve years (and many counseling sessions) later, Jim and Sarah are still married, minister beside each other, and have recently released a book together. Just How Married Do You Want to Be? is the theology and story of how they’re overcoming massive differences to become one in Christ. As the subtitle, “Practicing Oneness in Marriage,” suggests, their book aims to move beyond the classic stereotypes that characterize most Christian marriages. Instead of discussing gender roles within marriage, the Sumners focus on the biblical concept of “one flesh” union and its resulting implications. This approach allows them to attempt a middle road between the complementarian/egalitarian debate that has been raging in broader evangelicalism. Because the Sumners are attempting to establish what they term a “new paradigm,” a significant portion of the book is given to a theological overview of the concept of headship, especially as it is expressed in the head/body metaphor of Ephesians 5:22-33. In these chapters, they contribute an interesting, if somewhat novel, perspective to the current discussion. Rather than emphasizing hierarchy, the Sumners argue that the headship imagery of Ephesians 5 is primarily teaching the intrinsic “oneness” of a married couple. Undoubtedly much of the current controversy has revolved around what Paul meant when he wrote that “the husband is the head of the wife” (Eph. 5:23). Complementarians (the Sumners use the phrases “business model” and “democratic model” to distinguish the two perspectives) contend that Paul uses the word head (kephalē) to primarily convey the concept of “authority.” Thus “the head of the wife” is often understood as “the leader of the wife.” While, on the other hand, egalitarians argue that kephalē simply communicates “source,” as illustrated by the fact that Eve was taken from Adam’s side in the Genesis account. Metaphors are not meant to be taken literally. Metaphors are not meant to be defined (p. 38). Therefore attempts to extend the metaphor of a head and body beyond what the text specifically states miss the whole point—the mystery of one flesh union. The argument is at its strongest when the Sumners draw conclusions about why divorce is so horrific. If the relationship between a husband and wife functions primarily as a business, then divorce is simply the dissolution of a corporation. Worse, if it is a democracy, divorce is no more than the termination of a contract between consenting parties. But if, as the Sumners suggest, Paul is using the head/body metaphor to hit home the “one flesh” concept, the divorce of a man and woman suddenly becomes a gruesome decapitation. The rest of the book shifts to the practical applications that stem from marital oneness. Having rejected role playing, the Sumners address the topics of resolving conflict (via Matthew 18), defining expectations, and working through “hot button” issues—those irritations, specific to each us, that trigger sinful reactions. The goal of these chapters is not so much to provide explicit solutions as to teach married couples how to avoid and resolve problems that interrupt one flesh unity. After devoting another chapter to identifying certain personality types, the book wraps up by driving home the need for every Christian couple to exist in community with the rest of Christ’s body. I couldn’t decide if this is a confession or a disclaimer since, unfortunately, the book would benefit from several more revisions. There is still an obvious disjointedness and tension between the two narratives, creating a text that could be politely termed non-linear. Less polite descriptions include rambling and circular. Normally these structural flaws would be distracting, perhaps irritating; in this case, given the theme of the book, they are absolutely ironic. Despite these flaws, Just How Married Do You Want To Be? is an interesting addition to the gender debate. And it becomes all the more so when you know the back story. Not only is Sarah Sumner a theology professor and author, she is also a teaching pastor at New Song Church in San Dimas, CA (curriculum vita). And now for the twist. While at TEDS, Sumner studied under noted complementarian Wayne Grudem and even invited him to sit on her dissertation committee.1 Clearly Sumner has been walking a fine line between the two camps for most of her adult life. This book is no exception. For complementarians, there’s a lot to dislike. While the Sumners’ argument to interpret the head/body image simply as a metaphor may pique one’s curiosity, it does not sufficiently answer the next logical questions. What are the implications of the image of head and body? If kephalē corresponds to a literal head, doesn’t it bring with it the understanding that the head, at least in some way, governs the body? Surprisingly the Sumners say no. the husband is not called to be his wife’s “spiritual leader”…. Yes, the husband is commanded to minister to his wife, but she is commanded to minister to him, too (p. 62). The Sumners insist that, while paralleling Christ’s headship, a husband’s headship is not the same as Christ’s being the Lord and Savior of the Church. They believe that the initial analogy is limited to expressing unity and does not extend to the husband having leadership, spiritual or otherwise, over his wife. Not exactly the message egalitarians would hope to hear from a woman who is a seminary professor and pastor. And they recognize that this cannot happen apart from the Church. Apart from Christian community, couples are prone either to fall into a pit of marital fights or into … a false sense of oneness that couples experience when cooperating together in sin (p. 156). And isn’t that really the best advice any book on marriage can offer? 1 Sarah Sumner, Men and Women in the Church: Building Consensus on Christian Leadership (Downers Grove: InterVarsity, 2003) pp. 37-38. 2 Dorothy Kelley Patterson, of the complementarian Council on Biblical Manhood and Womanhood, expressed her opinion that although “Sumner wants to distance herself from egalitarianism… she is a perfect fit.” (https://www.cbmw.org/Journal/Vol-8-No-1/A-Review-of-Men-and-Women-in-the…). Hannah R. Anderson lives with her kephalē in rural Pennsylvania where he pastors Flatwoods Baptist Church. She spends most days chasing three little people, helping in church ministry, and looking for the odd moment to write. Thanks for the review. From the info here, it looks to me like an attempt to advocate the egalitarian view under a different name. Sounds like they see a real difference between their oneness view and egalitarianism, but that there really is a difference looks doubtful. It's always interesting to me how egalitarian-minded writers on this subject point to things like mutual submission and mutual edification (or in this case oneness), and think that it somehow erases the headship idea. If they are correct--and "headship" adds nothing to mutual submission/oneness--there is no reason for the headship passages to even exist! But the truth is that the headship concept coexists with mutual submission and edification, yet is something substantial in addition to it. Any persuasive effort at an egalitarian-marriage reading of the Bible has to deal with what exactly headship adds to oneness/mutual submission. I got the impression that the Sumners argument stems from recognizing the inadequacy of current egalitarian theology (in light of Biblical inerrancy) but an unwillingness to embrace traditional complementarian practice. The only solution left to them, then, is to reframe the entire discussion so as to accept the legitimacy of Biblical passages on headship but not the applications derived from them. Hence, a rather novel (and IMHO, inadequate) interpretation of headship. But, I do appreciate the tension the Sumners are trying to resolve - too often complementarian practice DOES fall prey to caricature and stereotype. I'd love to review the book written from a complementarian perspective that argues how a truly Biblical view of headship must also result in women having roles like Deborah, Phoebe, Priscilla, and Philip's prophesying daughters. Have you read Stackhouse's "Finally Feminist?" It's a really good book; I appreciate Stackhouse's work in general, and Stackhouse's book, based on lectures you can watch online (just google video "John G. Stackhouse") seems to a better job of offering a different paradigm yet still defending a form of egalitarianism. He sees the serious problems in both approaches as they are typically represented. I would encourage you to watch the lectures, as hearing Stackhouse speak helps convey his approach: he's very humble, which is refreshing for this topic. My wife and I are still complementarian, but we have finally come to the point of honestly being open to the Scriptures even if they say something different (we, like everyone else, would have said we were so open before, but we weren't). We're both very unhappy with most forms of complementarianism we've seen/read, so we're going to start reading the Catholics on gender and sexuality issues (they're far better than us on these topics, incidentally - a very rich tradition of thought). The spirit of the times is egalitarianism all the way. Being "more open to Scripture" doesn't generally lead toward greater harmony with the accepted views of those who do not have Christ as their Lord. Usually goes the other way. @Aaron: Very true. But we also have to ensure that we are not simply being counter-cultural in the name of being Biblical. I find egal/comp debate a sticky wicket because it has so many direct applications to our everyday lives. All of Scripture should come to bear on our actions, but gender issues in particular hit very close to (dare I say) home. This is why it's hard for people to be honest with the full body of Scripture. Egalitarians dismiss clear teaching of the epistles, and often we complementarians, downplay the roles of Biblical women who don't fit our current applications. The Sumners seem especially burdened that Christian couples move beyond role playing and embrace a truly Christian concept of oneness, the kind of oneness that comes only by spiritual growth. I like that, too. I think the development of true intimacy in all spheres of marriage is often overlooked, but how essential it is and really, if Christlike intimacy is the focus, so many issues tend to fall away or fall into place.